Do you require a hub? This calculator is for illustrative purposes only, exact payment terms will be provided prior to an application for finance. 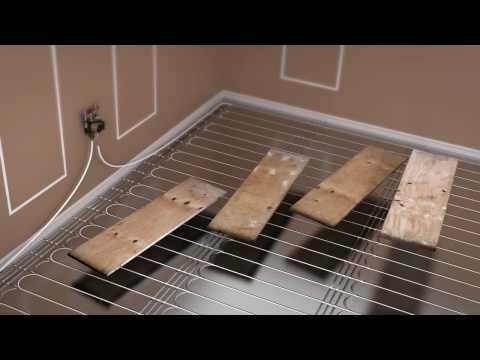 ProWarm™ Low Profile Multiple Room Water Underfloor Heating Systems are the ideal choice for homeowners and tradesmen wishing to install a Premium Branded water underfloor heating kit where the floor height and disruption needs to be kept to a minimum. ProWarm™ Low profile Water Underfloor Heating Multiple Room kits are ideal for heating different areas with different thermostats. Each kit is designed to cover an area in square meters when the pipe is spaced at 150mm apart, the 12mm pipes are fitted into our 18mm low profile insulation panels for fast installation, please see the technical details of the 2 different panels avaliable to see which is suitable for your floor covering. Please Note : ProWarm™ Low Profile Water Underfloor Heating kits feature water temperature control, beware of systems without this facility. ProWarm™ only use high quality European Standard Pex-Al-HDPE pipe. The aluminium layer acts as an oxygen barrier, preventing the oxygen diffusion through the polymer matrix, which stops corrosion of the metal components in the system. Visit www.prowarm.com for more details. Below are examples of all products which could comprise your ProWarm™ Water Underfloor Heating Kit. Find out exact manifold size and pipe length for your chosen kit size by using our handy Kit Content Comparison Table below. A rated UPS 2 Grundfos Manifold Pump/Mixing Valve Unit. For a small additional fee you can upgrade your thermostat to a digital, programmable, wireless or touchscreen one. Stainless steel manifold with adjustable flow meter allows easy balancing. Factory pre-assembled on fixing brackets. PLEASE NOTE: Wiring Center image is generic and may change depending on what thermostats are purchased. This table shows exactly what you'll get in the box based on your chosen kit size. ProWarm™ multilayer pipe was conceived and designed to satisfy the most demanding and diverse possible uses. The result is still the most innovative, multifunctional and most reliable pipe on the international market. ProWarm™ only use the highest quality 12mm (outside) European Standard Pex-Al-HDPE pipe. The triple layered pipe creates an oxygen barrier which is 100% tight and its diameter calculated to allow for maximum performance and flexibility. The middle aluminium layer diffuses the heat more efficiently and offers excellent conductivity, which is necessary for low-temperature systems. This allows the requirement of less pipe work to other systems. We offer a full package of high quality products, led by the ProWarm™ range. The installation of a high quality pipe with a long lifespan is of paramount importance in an underfloor heating system. After all, the replacement of a pipe system is an expensive and unnecessary job. ALL of our pipe is guaranteed by ProWarm™ for up to 50 years, longer than any other manufacturer on the market. All our kits come with the Heatmiser DS1, our 230v, electronic room thermostat, ideal for conventional or combi-boiler systems. This thermostat is used in conjunction with a separate programmer. The Heatmiser Slimline is our 230v programmable room stat and programmer in one, providing up to 4 different temperatures at different times of the day. The Heatmiser neoStat is our all new product for 2014, offering you a smarter way to control your heating from anywhere! The Heatmiser Slimline-RF works with the Heatmiser RC1-W Wireless receiver, which is hard wired to the boiler. The wireless thermostat is designed to be wall mounted in the area being controlled, up to 100 meters open space from the receiver. An optional repeater is available (Heatmiser WR1) in order to extend the communication distance. Heatmiser Touch-RF is our programmable wireless thermostat with Touchscreen display, ideal for those looking to relocate their existing thermostat. The Heatmiser Touch-RF works with the Two Zone Heatmiser RC1-WTS Wireless receiver. The receiver is hard wired to the boiler, so this can be located next to the boiler or you could use the existing thermostat cabling. The wireless thermostat can then be desk or wall mounted with range of the receiver (up to 100 meters open space) enabling you to relocate your thermostat. The neoStat communicates to the neoHub and other neoStats within your home, to create a fully controllable network system of your home heating. neoApp has been carefully designed with you in mind. It’s incredibly simple to download and use; giving you intuitive control over your home heating and hot water directly from your smartphone or tablet. In just a few quick screen taps you can change settings in all of your properties that have neoStats installed.